So today while browsing at my tobacconist I was looking at the top shelves in his humidors. On both sides, all nice wooden boxes. On one side, Gurkha. On the other was a brand I haven't heard of. Bucanero. There were about 5-6 different kinds and the prices were about the same as the Gurka ones. anywhere from $7 to $25. So when I get home I come look on the site and....nothing. They aren't even listed. I search the forums and....nothing. Anybody here try them? Anybody else even heard of them? They seem to be relatively new and don't seem to be very widespread. Their website lists an ambassador program. They will send your tobacconist a sampler pack. If they place an order, you get a free 10 pack of any of their blends. from what I can tell, they are a boutique brand that produces in small quantity. i have no personal experience with them but they look interesting. I may have to check em out. I bought last year after it was highly recommended by my old B&M. Haven't smoked it yet. He swore by them. Said it was along the lines of Padrons, Rockys, Olivas...so good quality. I trusted the guy on other smokes but I just haven't lit it up yet. Hell I have not smoked in over a month...it's driving me crazy. I'm gonna have to pick up one or two when I get paid again. Oddly enough, only the small tobacconist in town carries them. The really big one with the walk-in cooler doesn't have them. Andy.. What is up with that!! And yet you come on here and discuss cigars, and listen to all these guys share their great smoking experiences.. that has to be cruel and unusual punishment. Take an hour, relax, and light one up. Bucanero is a very small boutique brand. I personally have never had them but I know several others who enjoy the line. They like to market to small shops rather then larger ones so that isn't a surprise about the small B&M carrying them. Tell me about it. My new job has my schedules all jacked up. I Need To Smoke This Weekend. But the only good thing about not smoking is that the cigars are able to rest and age longer. the only good thing about not smoking is that the cigars are able to rest and age longer. thats exactly why just before winter starts i get a good order in. i can let them sit all winter in the humi so in the spring i can smoke a well rested stick. 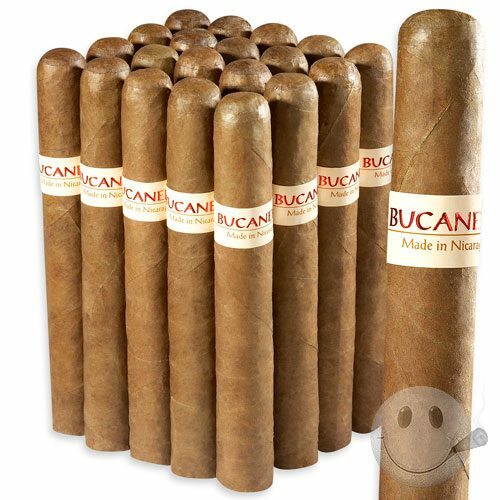 I was at a local cigar bar last night and while browsing their large walk-in humidor, I spotted some bucaneros. I picked up an El Capitan (they also had the salsa, full sail, Z, and classico). All were priced at $8-10 a piece, which seems reasonable. While it wasn't the most complex smoke I've had, it was very enjoyable until the last inch and a half, to two inches. I don't know if I'd compare it to the high end padrons or the aniversarios, but some of the lower end padrons (3000 series), maybe. For the most part, this one played like a one note instrument. Not to say that was bad, because the dominant note was done well and very pleasant. Just not a very complex cigar. Just my two cents. I'd say they're worth a try to satisfy your curiosity, but I wouldn't go in on a whole box unless I got a great price. I haven't had any Bucanero cigars before but I was given one of those cigars you posted being sold by CI they call "Bucanero Red". Which in reality it is a Fuma with the Windjammer Band (nothing similar to the windjammer blend at all) and as far as what is in this cigar and what it is wrapped with I don't know either. I do know they are actually not bad for the price but nothing special either, you get a dollar cigar for a dollar basically (which is actually VERY hard to find these days my yard gar has gone up in price about 3 fold so i have been trying others). Off subject but about a good yard gar the best new yard gar is a < 2 dollar stick made by EO called EO # 21 as they are made by EO and they come in a bundle of 21. They are a long filler blend of Nicaraguan. Honduran, and Panamanian Tobaccos with a Ecuador Connecticut Wrapper. Cheapest Yard Gar I smoke Besides the CFO #7 which are also Very good for the price I know this is not a post about cheap cigars, I just wanted to let anyone know who might be interested. In all IMO in these times due to the HIGH Import costs boutique blends will soon only be made by company's that also mass produce. As small batch or Boutique company's are going to falter quickly without amping up production to make more money for the import costs. I think its sad as this bill has HURT SMALL BUSINESS which should be the opposite of what Obama should be doing but this bill focused on health care did not take small Business owners into account, we will have less B&M cigars stores and the ones that stay will be forces to not only hike the prices but most will either have new lounge rules (like a cutting fee or must buy here rules) or remove the lounges to make room for cigarettes to help the income. I got a torpedo Maybe I am lucky also as this is a mass produced cigar from a company that does not do this I would not be surprised if these cigars were even contracted out maybe to a torcredor school or a large company. In all I would have to smoke another to make a review I have one and i will if anyone is interested. but as of now this is m 2 cents on the subject. Wow, Great planning! Im going to do that this fall? But isnt it torture looking at all those nice sticks all winter long?